I grew up with South Africa…and didn’t even know it. I can remember episodes of “The Cosby Show” with Miriam Makeba as a guest star, singing and speaking in her click language. I remember episodes of “A Different World” that discussed boycotting companies that supported apartheid and had not divested from South Africa. Something as simple as a Life Savers commercial introduced me to the sounds of Ladysmith Black Mambazo. I remember when Ebony Magazine covered the South African General Election in 1994. And who could forget “Sarafina!”?! My earliest memory of the Tony Awards was seeing Leleti Khumalo as a nominee for her role in the Broadway production. I thought to myself “she’s so pretty”. I think that was the first time I remember seeing black people on the Tony Awards. And then the film which I watched over and over…and over and over and over again (…and my secret nickname for myself was Sarafina…). All these things were a part of my growing up. The sounds and culture and politics of South Africa filtered through American pop culture stuck with me. These tiny seeds were deposited into my psyche and planted a desire to visit this place. Africa. Then, it was just Africa. Later, the desire became more specific. South Africa, Ghana, Nigeria, Tanzania… The little bits of knowledge of varying countries and cultures and languages and history intrigued me. I didn’t always understand exactly what was being discussed. I just remember thinking that these were black people who looked like me but didn’t quite sound like me. Their singing and dancing and even speaking was so passionate that it cut right through me. I knew that whatever they were discussing or dancing or singing about had to be something heavy…something important. Yesterday, the sixth of December, 2013, Nelson Mandela passed. In the past weeks and months there have been many rumours of his passing due to his failing health. But the facebook posts that I saw announcing his death were followed by news reports on several networks. So I knew that this wasn’t just a rumour. And I was happy. Happy that this man was free from his earthly discomfort. Happy that so many people were celebrating his life. I watched the reports and read the tributes that began popping up and I thought about all the bits and pieces of South Africa that I grew up with. But even more than that, I started thinking about my South African friends and co-workers in “The Lion King”. People who grew up knowing his story and living life in that same country. Last night after the show I watched as they sang the anthem of their country and read a poem in tribute to him. The cast stood behind them in support and the entire audience stood in reverence. And you could hear a pin drop. You could see faces glistening with tears. You could feel the weight of the profound impact that this man’s life has made. He was born a South African and fought for the rights of his own people in his own country. But his struggle was not only for himself; it was for all of us. And I could tell, by the silence in The Pantages Theatre that everyone recognized that fact. Many will try to bash his legacy and “remind” the world of his imperfections. But we all have imperfections. What will live on is his fight for those with no voice, his forgiveness for his oppressors, his service to his country and the world. The mark that he left cannot ever be erased. And i’m proud to be a part of something that gives the world a little taste of his country. Maybe somewhere in America there is a little black girl or white girl or asian girl or indian girl who watches the gift that I get to give every night and wonders where it came from. Hopefully her mind will be opened enough to dig a little deeper; to water the seeds that have been planted; to honor a culture that is not her own; to be a part of it’s preservation. Madiba’s legacy is for that little girl. 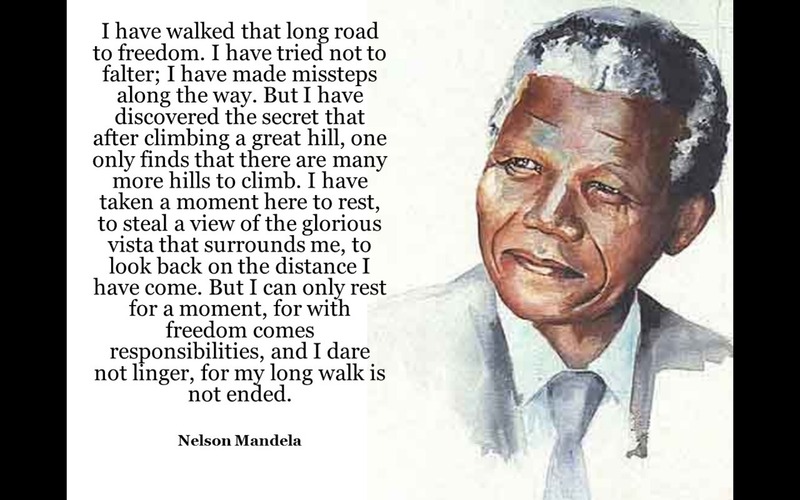 Madiba’s legacy is for us all. I love this. Wow sometimes I say, “did we grow up in the same house.” Only because I am always amazed at your reflections and myself what was I seeing during the moments she was seeing. We were both watching together. Love your beautiful reflections.